Sources say Hamas offered 40-hour ceasefire last week, but rejected it; Cairo working quietly for ceasefire despite contrary reports. Despite reports that Cairo has been staying out of the conflict between Israel and Gaza-based terrorist groups, Egyptian officials have reportedly been working behind the scenes to broker a temporary ceasefire between the sides - but to no avail. Attempts to do so ultimately fizzled out last week, and rocket fire on Israel continued. However, while Hamas and PLO officials have blamed Israel for the lack of a cease-fire, it was actually Hamas who rejected the offer of a 40-hour "cooling-off" period, Walla! News revealed Sunday. Both Israeli and Palestinian Arab sources told the daily that Cairo presented Israel's offer of a ceasefire to Deputy Head of the unity government Political Bureau, Moussa Abu Marzouk last week. Marzouk immediately rejected the cease fire, the sources said, after a brief consultation with senior officials from Hamas's "military wing," the Ezzadine Al-Qassam Brigades. Egyptian officials stressed that were not be responsible for publishing Hamas's rejection of the offer, but did say that Hamas would be responsible for the negative repercussions of that decision. The sources added that while neither Israel nor Hamas has presented a counter-offer, European countries, the US, and Egypt are all kicking around options to bring an end to the fighting. Palestinian Authority and Hamas spokesmen have said repeatedly since the operation was launched last week that Hamas has no interest in a cease-fire. Hamas spokesman Sami Abu Zuhri stressed Saturday that no one "presented us with no plan or outline for a cease-fire" and that there is "nothing to talk about while aggression continues." Former Palestine Liberation Organization (PLO) legal adviser and negotiator Diana Buttu went so far on Friday as to accuse Israel of rejecting a cease-fire, as well as breaking previous cease-fires, in a wooden monologue later ripped apart by CNN's Jake Tapper. It should be noted that Hamas has breached each previous cease-fire, continuing a steady trickle of rockets or turning a blind eye to attacks by other terrorist groups. As of June, before the recent escalation, over 450 rockets had been fired at Israel since the previous ceasefire was brokered at the end of 2012. Israeli officials, for their part, have rejected the idea of a cease-fire as well at this point, saying that after approximately 8,000 rockets have been fired on Israeli civilians since the 2005 Disengagement from Gaza they would accept nothing should of an unconditional end to the attacks. 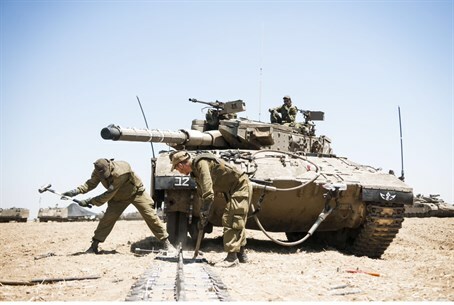 "The pace of attacks in this operation is double that of Operation Pillar of Defense and the military strikes will continue until we can be certain that the quiet has returned to Israeli citizens," Prime Minister Binyamin Netanyahu stated Friday afternoon. Not even international pressure would sway Jerusalem from protecting its citizens, he said - despite multiple calls for restraint and an absolute skewering from the United Nations Human Rights High Commissioner, Navi Pillay. "I had good talks with all of them, with German Chancellor Angela Merkel, Canadian Prime Minister Stephen Harper and British Prime Minister David Cameron, and of course with French President Francois Hollande," Netanyahu noted. "To all of them I said something simple – no country would accept its civilians being fired at without a harsh response." "I said that I would not allow Israel's citizens to live in this reality," he added. "No international pressure will prevent us from operating with full force against a terrorist organization that calls for our destruction." There appears to be a broad consensus within the coalition government on the issue. "The Israeli government at this stage is not answering ceasefire efforts because we want to know first that we have taken away Hamas's desire to do this again in another year or six months," Finance Minister and Yesh Atid party head Yair Lapid told IDF Radio Sunday. "That has not happened yet. When that happens, then we can talk."